1994. 3 men meet at a community college in Britain. The men create a band and after a few look and sound tweaks, release two Eps and their first album, Showbiz, in 1999. Sound familiar? 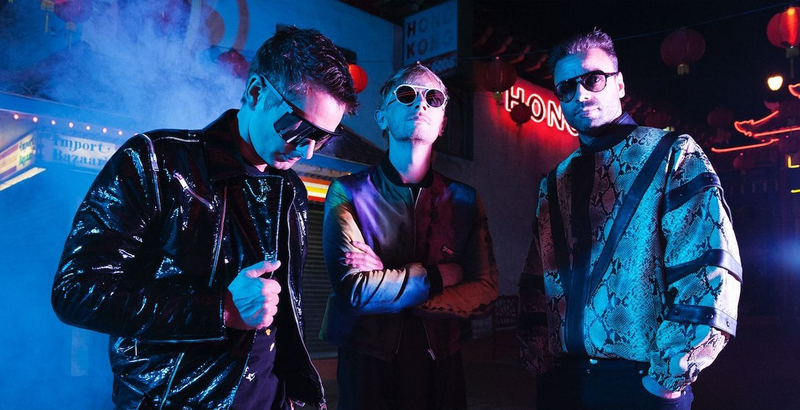 Maybe not, but this is the humble beginning story of the guys from MUSE who just dropped their 8th studio album, Simulation theory, on November 9th, 2018. I’d be surprised if you didn’t know the band but as always, I write this so if you’re not familiar, you’ll want to be soon! The MUSE sound has evolved and changed over the years as most great bands do but has retained the core which makes it stand out among other acts. The synth is thick, the bass is distorted, and the falsetto’s are plenty. Showbiz, their first release, could be described as melancholic alt rock. The second release, Origin of Symmetry, added a romantic classical feel with a large array of instrumentation added to the rock. Absolution, their third album and the one that I was introduced to, continues the addition of orchestra in a big way and also gave us the amazing single Hysteria. Black Holes and Revelations may be the album you heard first as it had songs featured in many medias, notably the original Twilight during the baseball scene, and added a more synth pop feel. The next two releases, The Resistance and the 2nd Law, covered themes of government oppression and civil uprising and kept the synth feel of the previous release, even adding a dubstep song. Drones, saw a return to the hard rock sound of their early music and is my personal least favorite effort to date. Simulation Theory has a huge synthesizer feel and is influenced by science fiction and the simulation hypothesis (think the matrix). The album lyrically explores the role of simulation in society through the lens of this theory, which proposes that reality is a simulation. Citing acts such as Lana Del Ray, the band wanted to blend elements of music from different eras. Opening track Algorithm feels like an opening credit theme from an 80’s science fiction television show but quickly adds Matt’s famous piano arpeggios followed by staccato orchestra hits. The Dark Side is a light, potentially pop tune (contrasting the title). The hook in the chorus is huge and the song is chock full of electronic sounds. Pressure is the albums first rock anthem. Showcasing all the electronics they’re known for; this track is a fun listen. Propaganda is the most Prince song I’ve ever heard that wasn’t actually by Prince. Listen and tell me I’m wrong. Seriously, might be my favorite track so far. Break It to Me is stripped down and very vocally focused. Matt has always been able to harmonize with himself in a very unique way showcased here. Something Human is admittedly folk rock inspired about Matt’s burnout and homesickness towards the end of tour. A “tender, down-to-earth, simplistic song” this track could easily be a radio hit. Thought Contagion brings me back to old Muse, focused on Chris’ bassline and Dom’s tom beat. The chorus recalls Matt’s concerns about the power misinformed or ideological people have over their audiences. The title was inspired by Scientist Richard Dawkin’s who compared the spread of thoughts, “regardless of their accuracy and truth” to a viral disease. Get Up and Fight is an ethereal track graced by a female voice sample melody line. The chorus picks up with a full wall of synth. Blockades is a driving anthem. Synth arpeggios fly behind the bass and drum verse. A classic Muse chorus comes after to polish this track off. Well rounded and very Muse. Dig Down was our first preview of this album. Reminiscent of their track “Madness”, the track feels anthemic. It grows on you as you listen for sure so don’t write it off after a single listen. Lyrically, Matt hoped to give “inspiration, optimism, and hope to people to fight for the causes they believe in” citing Brexit and the election of Trump. The Void hits old Muse for me too. Vocals are accented by a vocoder and the synth grows each passage. Starting very stripped, layers are added as the song progresses. A solid ending track for this wonderful record. The version of the album I got on iTunes features some acoustic tracks and such as well. Personally, this album was what I wanted out of a new Muse album. Drones was my least favorite of all of their efforts and my faith has been restored with this album. Drones was by no means a bad album, but it was not a Muse record for me. The synth and experimentation with sounds has defined them for me and is certainly where their strength lies. You won’t hear an album like this one this year. Delightfully different, Simulation Theory is worth a listen for old and new fans alike. The band will be hitting the road early next year and I cannot stress enough how amazing these guys are live. You can bet we’ll be putting in to cover it. Simulation theory is going to get a 9/10 from us. I’m thoroughly enjoying this after the last album but let’s be honest, the only 10/10 you’ll see from me is Rammstein related. Get it today and let us know what you think!